Are you a professional marketer who wants to read some great public speaking tips you can put in practise in your next keynote presentation? I will share below the best public speaking tips for you from my experience and learnings I have accumulated during many years running hundreds of public speaking presentations, strategy workshops and training sessions. Before we get started, I would like to say that there is no a single valid and optimal technique for public speaking. Your public speaking will improve with time as your style will evolve and audiences change. I am myself learning every time I have the pleasure to speak in public; however that I tried to remind myself on few simple practical tips rather than buying “public speaking training” books or “public speaking training” courses and trying to remember it all. Why? Public speaking courses and books can be overwhelming and will make you to self-aware to the point that it would not help you build your own public speaking style. 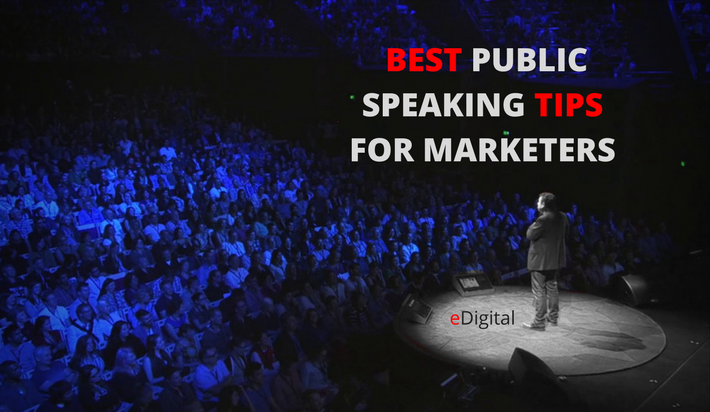 WHY PUBLIC SPEAKING TIPS FOR MARKETERS? Evolve your industry. You public speak because you want to be a contributor on key topics that are challenging your industry. You want to share your point of view and be heard by other industry colleagues. Teach. Sharing knowledge, making sure people understanding it but also ensuring everyone has the tools or guidelines to put in practice is one of the most popular reasons why we love public speaking. Make you happy!. It feels “good” seeing people are actioning the insights you have passed. Learn. One of the most amazing things you will like about public speaking is when you have the time and opportunity to listen your audience and learn from them new perspectives about the issues being discussed. Get buy in. You as a marketer “public speak” for a reason. These might be getting buy for extra budget, new marketing strategy direction or new resources to be needed for your marketing executions. Public speaking is not only a privilege for a marketing practitioner but also a massive responsibility! Your promise to your audience is that the info and insights you will be sharing are relevant, useful and clear and that you are there to show them – some times convince them – about the value of your ideas. Below I am sharing the key factors I personally like to remember when having my public speaking engagements. I have taken some of these tips from blog articles, checkout some great ted talks and of course remembering what I liked from other speakers I have the pleasure to learn from. Event before you enter the board room or the conference room for your keynote, it is very likely the audience have already set certain expectations about your public speech because of your presentation title and your presentation description they already read few days or few hours before your presentation. Imagine people can go to see 10 speakers like you talking about the same topic but choose only one. What does your presentation title need to say so you can actually attract the right audience to listen your keynote? Some marketers who are new to public speaking have the belief that their audience are there to measure how good you are as a public speaker or how correct your knowledge is. The reality is that most of the time your audience is there to learn from you, by default humans trust that you are there to help them, to transfer your experience and knowledge. It is your believe and your certainty about your presentation idea that engages your audience. Your public speaking has to show that energy! You are a marketer who is anxious about your next public speaking presentation. it is totally fine what you feel 🙂 In fact, public speaking tops the list of phobias for most people. Not spiders or heights – public speaking – speech in public! Be certain about the environment. The environment setting will also impact your audience’s attention, focus and eagerness to listen to you. You need to make sure the environment is comfortable and conductive for your talk. Be certain about your key messages. It is a must to rehearse and memorise your key message. It does not look good if you forget the most important things you wanted to say. Be certain about potential questions. Make a list of the top 20 questions your audience might be asking and have the answers in your mind ready. This exercise will also help you when you are ready to say things like “You might be thinking how can we blablabla“. You are here anticipating what people are thinking about. Be certain what to do when an attendee corrects something you said. You might say something that it is out-of-date or incorrect and someone might say that to you. What to do? You thank the contribution and you could say you will double check your sources. Be certain what to respond when you do not know how to answer a question from the public. In these situations you could say: “I am not really sure about that, I will have to check and get back to you” and hand the person my business card. The other thing you could you is to pass the question to your audience. This way you show you have been consultative allow space for other experts to participate. Be prepared for conflicting opinions. That can happen and it is fine if it happens. What you could say is: “Thank you; that’s very interesting because my believe is that blablabla and that’s because… (give two or three key reasons). However lets talk after the presentation as I’d like to learn more about your perspective on this” This way you respect the other opinion (even if you believe it is wrong), move on to your presentation and open a friendly discussion with the person after your presentation. Break down your presentation to 3-4 chucks and define a transferable idea for each chunk. A transferable idea for a chuck is the answer when you ask: What do I want my attendees to remember/action or share after the presentation about this chunk? Memorising the topic and key message of each chunk will you be seen as a professional well prepared public speaker as attendees will notice that you have it so clear what you are going to deliver to them. what time the presentation will be finish in case they need to confirm pick up time to someone. Tell them where they can find the presentation slides. Make it super easy! Share a Slideshare link to your preso. Allow for introductions. Everyone to say their names and what they do; people not only go to conferences to listen you but also to network so you can help on that. When I have an audience that it is more than 20 pax, what I do is to ask people to show their hand if they are from a specific occupation: “Show hands who are marketers!“. This way, at least every can have a feeling of who is in the room. Obviously if you present to a group that they know each other, you do not have to do this. Speak slower that normal. Yes, speak slower no matter what. Why? Cause you want to make sure people understand you. Just take your time, pronounce clearly and securely. Repeat important messages. It is not only great but useful repeating important messages two or three times. This will help your audience confirm what you believe it is really important. Repeating the titles of your presentation slides. Explain how to do something. When explaining how to do something, break it into 3-4 steps maximum and explain each step with an example of case study as much as time allows. Share sources. It is totally fine to share who has helped you to get to your final ideas and insights. The reality is that most of ideas created every day and influenced by the things we read (other experts), the things we experience (given them to us by other practitioners), etc. Kill the closeness problem by imaging yourself you are an attendee who have no idea about the topic you are talking about. Do you know what the closeness problem is? The more you know about something the harder it is to see it from the perspective of your audience. Thats when information becomes vague and full of jargon. The solution: consider the audience’s perspective. Use adjectives such as: groundbreaking, pioneering, radical, cutting age, game changer, staggering, insanely great, leading edge, trendsetting, amazing, stunning, astonishing, mind blowing. Create urgency: explain what the audience will be missing out if they do not action the idea in a specific time period. End with one single final transferable message. Your final message needs to be SIMPLE so your audience can remember and share it. Did the presentation delivered what you expected? Did the presenter offer the knowledge and tools to solve your current issues and challenges? Would you comeback to see this presenter again? What’s your best suggestion to make this presentation better? I like to use the “B” key to blank the power point presentation when I really want people to look at me and pay attention at what I want to explain. I would suggest you to try this trick and see how you go.